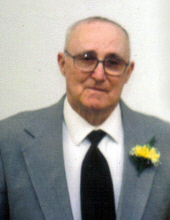 Jessie G. "Gene" Ballinger, 84, of Effingham, Illinois, formerly of Neoga, Illinois, passed away at 12:45 A.M., Saturday, December 29, 2018 at the Petersen Health Care Center of Effingham, Illinois. Gene was born March 3, 1934, in Cumberland County, Illinois, the son of Henry A. and Opal (Shadow) Ballinger. Gene enjoyed life and visiting with his family and friends, helping anyone he could, he also attended the Free Methodist Church of Neoga. Mr. Ballinger was a retired service manager for the International Harvester Company of Mattoon, Illinois. He married Ruby Armstrong, October 14, 1952, in Shelby County, Illinois and Mrs. Ballinger passed away February 8, 2011. Mr. Ballinger leaves eight children, Jeanie (Gary) Creath of Washington, Missouri, Virginia (Stan) Williams of Shelbyville, Illinois, Jackie (Jeff) Karrick of Neoga, Illinois, Donna (Randy) Brown of Savoy, Illinois, Kim (Bill) Hilvety of Herrick, Illinois, Peter (Marla) Ballinger of Windsor, Illinois, Janice Blackwell of Neoga, Illinois and Todd (Susan) Ballinger of Effingham, Illinois; one brother, Ervin Ballinger of Altamont, Illinois; twenty-five grandchildren, thirty-six great grandchildren and three great great grandchildren. Mr. Ballinger was preceded in death by his parents, wife, Ruby Ballinger, Companion, Hazel Warner; three daughters, twins, Alice and Allison Ballinger and Tammie Baker; four brothers, Henry Jr, Marion, Dale and Raymond Ballinger; one sister, Delores Mueller; one grandson, Jonathan "Spide" Williams. Funeral services will be held at 10:00 A.M., Tuesday, January 8, 2019, at Swengel-O'Dell Funeral Home in Neoga, Illinois, with Pastors, Bobby Kemp and Matthew Creath, officiating. Visitation for family and friends will be held from 5:00 to 7:00 P.M., Monday, January 7, 2019, at the funeral home. Burial will be in the Swedish Lutheran Cemetery, Big Spring Twp,. Shelby County, Illinois. The Swengel-O’Dell Funeral Home of Neoga, is in charge of arrangements. To send flowers or a remembrance gift to the family of JESSIE G. BALLINGER, please visit our Tribute Store. "Email Address" would like to share the life celebration of JESSIE G. BALLINGER. Click on the "link" to go to share a favorite memory or leave a condolence message for the family.